Tour leaders and trade show presenters increasingly are using hand-held tour guide microphones to expand the interactive capabilities of their wireless tour audio system. TourGuide Solutions offers hand-held tour guide microphones for two of their most popular one-way tour guide systems. Many trade show rental customers request hand-held microphones as the system’s transmitter for the ability to pass the mic when appropriate. This enables tour leaders to balance keeping control of the tour through the use of high-quality audio with encouraging guest and multiple speaker participation. 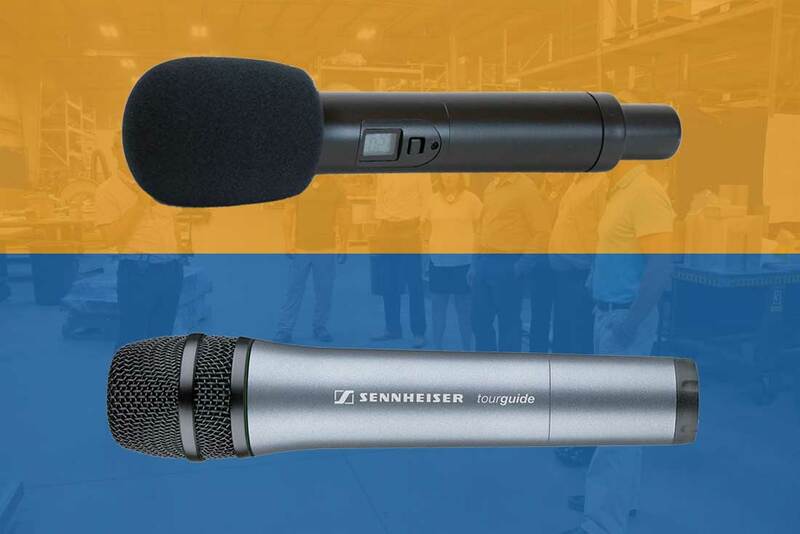 TourGuide Solutions supplies hand-held microphones for its Sennheiser and TGS-900 one-way tour guide systems. Why use hand-held tour guide microphones for your next manufacturing or training event? Many manufacturing and lean events require additional collaboration with multiple tour guides or guests along the way. This can be accomplished with a ListenTALK 2-way audio system or by using a hand-held microphone with your one-way system. Hand-held tour guide microphones can amplify your guests’ ability to contribute to the overall tour experience during special events or in the course of regular operations. To read about how the AME event uses the hand-held microphones click here. TourGuide Solutions is an affiliate company of OwnersEdge Inc., a 100 percent employee-owned ESOP holding company based in Brookfield, Wisconsin. TourGuide Solutions, founded in 1998, provides a wide range of Fortune 500 companies with audio equipment to usher guests through live, interactive plant tours. Its clients include Toyota, Nestle, Coca-Cola, Kellogg’s, Whirlpool, John Deere and P&G. TourGuide Solutions represents a wide array of product lines, including Sennheiser 2020, Williams Sound Digi-Wave, Listen Technologies, ListenTALK and its own TGS-900. TourGuide Solutions offers warranty protection, with post-warranty care standard with every purchase. Next-day service is available to locations within the United States. Call 877-204-0225 or visit http://tourguidesolutions.com for more information about hand-held tour guide microphones or to request a quote.